Opal Doll and The One and Only: Dance through the One and Only with this delightful 11" Opal Doll. Charming Opal is positively the most precious piglet in pink! She is dressed up in a soft iridescent organza tutu with a satin bodice trimmed with sparkly pink braid and a satin ribbon rosette. 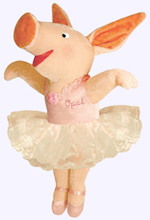 With her blushing cheeks, soft velour figure and curly tail, embroidered eyes, sparkly velvet inner ears and smile, and satin ballet slippers, Opal will dance her way into every girl's heart! The One and Only. 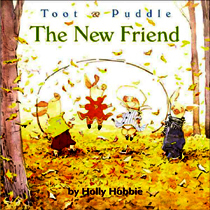 Story by Holly Hobbie. Hardcover. Ages 4 - 8. The New Friend: Opal brings her new friend Daphne while visiting Toot and Puddle. 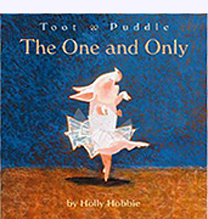 Story by Holly Hobbie. Hardcover Picture Book. Ages 4 - 8. Charming Opal: Her name is Opal. She is Puddle's cousin. 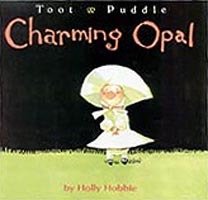 This story written and illustrated by Holly Hobbie is about the time Opal came to Woodcock Pocket. Hardcvoer Picture Book. Ages 4 - 8.